The Los Angeles teachers strike is part of a growing movement of teachers that have made gains by striking. It's an example for the entire labor movement to follow. Los Angeles teachers have become a beacon for the rest of organized labor. Though incremental gains may have been possible in recent decades, even with a largely passive membership, a narrow definition of members’ interests to bread-and-butter issues like wages and no more, and a hierarchical organizational structure, teachers unions have been unable to win meaningful economic gains, let alone stanch deteriorating working conditions, for at least a decade. Capitalism has changed, radically; the unions have not. Both Democrats and Republicans have supported policies of austerity like privatization and union-busting, which have led to the well-documented transfer of wealth and power from working people to wealthy elites. The idea that education is a market that has to be opened to profit-making is central to this offensive of wealthy elites to overturn social and political gains of the past fifty years. The Los Angeles Unified School District’s (LAUSD) assertion that money does not exist to fund the union’s demands is based not just on the district’s unwillingness to part with its reserve fund of nearly $2 billion but on the false premises of austerity, claiming scarcity for the poor but unlimited resources for the rich. Teachers are angry and frustrated because they have been held “accountable” for students’ academic success, measured by standardized test scores — over which they have little control. The Right orchestrated a witch hunt to weaken their resistance to privatization and standardized testing. Changes in teachers’ work mirror the degradation of work in the private sector, through, for example, outsourcing and use of data information technologies for surveillance and control. But the psycho-social demands of teaching have simultaneously been greatly intensified. As is the case in “women’s work” throughout the world, cuts in social services have been exacerbated by increases in students’ needs at a time of increasing poverty, gentrification, and austerity. The women who do care work suffer the dual effects. The UTLA strike should also put to rest liberal analysts’ specious analysis that “red-state” walkouts could be explained in isolation from the vast changes in teachers’ work related to privatization of education. In the “red states,” teachers who had no collective bargaining rights had no collective voice. They organized direct action independent of the tiny state affiliates of NEA and AFT with direct action that the unions were unwilling to organize or lead. At the same time, many teachers in school districts in “blue” states with collective bargaining, especially those in cities and the low-income racially isolated suburbs that now ring urban areas, have felt that while they have unions in name and pay dues, they have little union protection or representation. But in the past fifteen years, nodules of teacher activists have built on and learned from these struggles. The first iteration of the now-burgeoning national movement to create fighting unions that defend social justice was in LA, which encouraged the formation of the Caucus of Rank-and-file Educators (CORE), a rank-and-file reform slate that argued for alliances with community groups against free-market reform in education, in Chicago. CORE’s election to the CTU leadership and its 2012 strike put teacher unionism back on the map as a progressive force for change in education. It also sparked reform efforts in other unions, including Union Power, the slate of officers which now leads UTLA. The 2016 presidential election challenged the political status quo, from the Right with Trump and the Left with Sanders; this destabilization created fertile ground for popular movements. In the “red states,” teacher frustration, long stifled, took the form of walkouts organized by teachers who were mostly new to union work. But as the walkouts developed, “red state” walkout leaders and participants learned from a national network of union reformers. 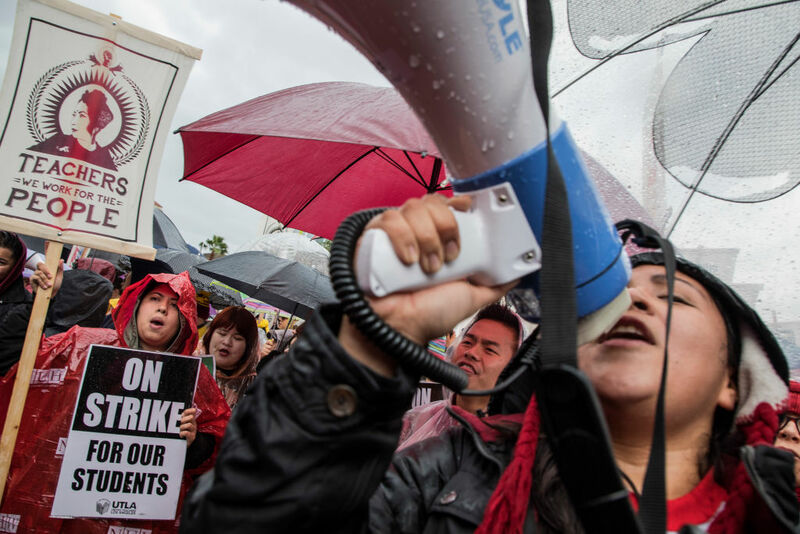 Now, UTLA’s strike can further energize the movement to remake teachers’ unions from the bottom up, fusing a commitment to union democracy and social justice struggles to traditional economic union demands. Signs are promising: already, a new group called California Educators Rising has urged teachers throughout the state to have their schools “adopt” a striking school so as to create contacts and expand the network of teacher activists. “Walk-ins” — demonstrations of teachers, students, and parents in front of schools before the school day begins — are being organized throughout the country in support of UTLA. From Louisiana to California, the national movement of teacher activists is expanding at such a breathtakingly rapid pace, its spread is difficult to track. Strikes draw a physical line. The tally of those who cross and those who do not is forever remembered by those involved. But UTLA has drawn a political line as well. The strike has already pried loose money (somehow not available on the day before the strike began) from the LA County Supervisors for mental health counselors for LAUSD. The strike forced Democrat Tony Thurmond to break his silence on the contract struggle and issue a statement of support. LA’s mayor, Eric Garcetti, shifted from his silence about a contract struggle that affected more than half a million LA children to belated verbal support of the strike aims after the strike’s first day and the show of enormous popular support for the teachers. In so doing, however, he also bowed to LA’s power elite and Beutner by warning “we must also ensure the long-term fiscal health of the district” by having a “responsible” contract. Garcetti has now been forced to move further in support of the union, serving as a mediator in resumed negotiations. Though we do not know what occurred in private discussions within California’s Democratic Party, the strike has further forced California’s Democrats to risk losing support of the wealthy, powerful business interests who fund their campaigns and mostly control the party apparatus. Hence UTLA has accomplished what neither NEA or AFT has: make the Democrats support a popular movement to fight Trump’s and the GOP’s transfer of wealth and the bipartisan project to transform education into a profit center controlled by elites. Education is not and can’t be the “one true path out of poverty” as Obama’s secretary of education insisted in selling charter schools and “choice” to low-income parents of color whose neighborhood schools were far inferior to those in affluent suburbs. Education cannot replace full employment, universal health care, affordable housing, improved wages, and good unions to improve our livelihoods and quality of life. What public education can do under capitalism is democratize the competition for the rapidly diminishing number of “good” jobs by giving all students schools that can equalize outcomes. Equally important is our educating the next generation of citizens to understand and defend democracy and social justice. As we have seen in the strong support UTLA has received, the struggle for quality schools for all students is a powerful and popular pushback to political and economic forces that deepen inequality. Some of UTLA’s original contract demands, like having green space in city schools that lacked neighborhood parks, were not within the legal scope of bargaining and had to be taken off the table. Yet in taking these issues into bargaining (despite knowing they were verboten), the union pushed the envelope in using collective bargaining to reimagine public education for children who live in poverty. A lobbyist once told me that politicians don’t care about poor people because they don’t vote. While no one can predict the outcome of any strike, we can say with certainty that UTLA has already changed the political equation in California and the nation so that the needs of children and working people are being heard. Their movement, demanding a new kind of labor union and unafraid to strike, is growing by the day. Lois Weiner is an independent researcher specializing in teacher union transformation. She is on the editorial board of the socialist journal New Politics .